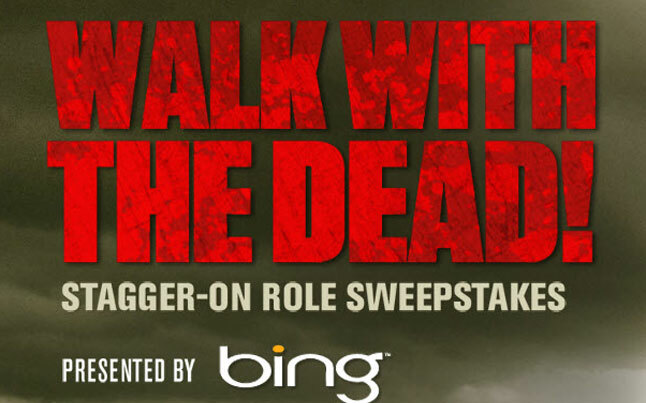 Microsoft’s search engine, Bing, is presenting a sweepstakes for AMC’s upcoming show The Walking Dead. The “Stagger-On Role Sweepstakes” will give some lucky fan the trip of their life. One winner gets a trip for two to the set of The Walking Dead season 3 and gets transformed into one of the zombies that will be featured in show. The drawing will occur around the 14th of December this year. The sweepstakes began yesterday and will run through the November 27th, so you have lots of time. You can enter once per day. Why wait, get over to the sweepstakes and get your name in there today.